Due to the high demand for online shipping, the need for storage space is also on the rise. At the same time, real estate prices are skyrocketing – especially near major cities. The solution is to create extremely compact high rack warehouses, which provide optimal use of the storage area. This also changes the requirements for narrow aisle trucks, which are currently expected to achieve lifting heights of up to 17 meters. Moreover, modern e-commerce logistics requires high throughput rates in order to achieve optimized storage times. 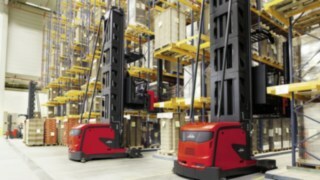 The new version of the K combi-truck from Linde Material Handling enables high handling performance both in order picking and also in handling processes in high rack warehouses. 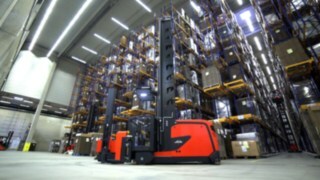 To this end, handling, construction, and equipment were tailored precisely to suit the conditions in high rack warehouses as well as the ergonomic requirements of forklift drivers. Optimized components, improved systems and even better performance make the new K truck into a highly efficient narrow-aisle truck for order picking and handling processes. 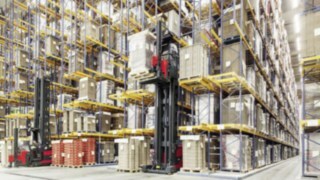 In high rack warehouses efficient handling and the highest level of safety are essential. 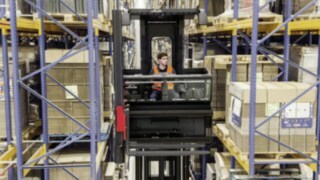 The new version of the narrow-aisle K truck offers assistance and safety systems that provide the driver with secure and fast removal and storage of goods, even at high lifting heights. Optimized lifting and driving movements and an improved mast also make for greater productivity and energy efficiency. Here you can see the highlights in detail. 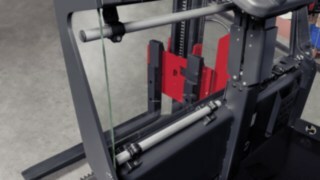 “Dynamic Reach Control" is an extension of the three variants of the assistance system "Linde System Control" and reduces lateral oscillations at high lifting heights. These oscillations make the precise transport of goods in and out of storage more difficult and slow down the handling process. 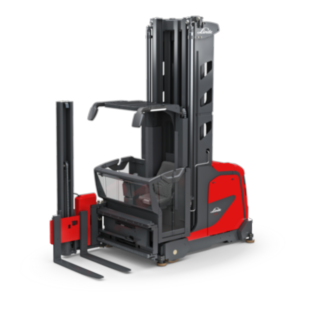 With “Dynamic Reach Control” the drivers can position the loads more quickly, more safely and more easily than before. This has a significant impact on productivity: increasing it by around 20 percent with “Dynamic Reach Control” compared to using the standard version of “Linde System Control”. A movement restriction comes into effect dependent on the lifting height and the load weight and on the lateral movement of the mast when removing and storing items. The system thereby ensures smooth and precise mast movement in the direction of the shelf. "Dynamic Reach Control" also helps to avoid the so-called chimney effect, i.e. the bending of the mast at high lifting heights. When the mast is bent the forks are pushed slightly forward which, in the case of low shelf heights, results in varying storage depths; an undesirable effect that “Dynamic Reach Control” corrects. The control panel of the new K truck has a high-quality, full-color display. 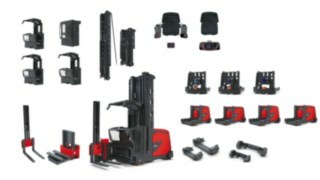 This constantly provides the driver with all the relevant information at a glance: from the speed of the forklift and the lifting height to the steering angle and the time of day. The immediate visibility of the central operating parameters ensures safe and efficient handling. 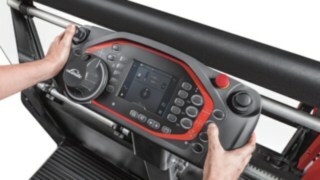 The overall ergonomics of the control panel have been optimized in such a way to ensure that the driver’s hands are in a natural position at all times. The distances of the control elements are designed precisely to enable fatigue-free work. For the comfort of the individual operator, whether sitting or standing, the height and the angle of the desk as well as the tilt of the console arm can be adjusted with a single-hand grip. With the new K truck, loads can be set down considerably more quickly in a given storage location. Because, as of now, the main and auxiliary lifts can be raised or lowered simultaneously. In this way the driver can drive to, for example, a particularly high or low storage bay in one step. Previously the driver often had to operate the main lift first and then the auxiliary lift after it. The forks can also be put in to position considerably more quickly through simultaneous controls and are very easily controlled at a convenient height. The lifting height of the new K model is a maximum of 18 meters. 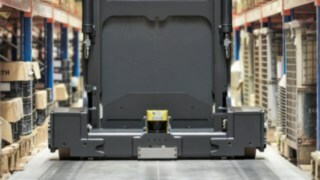 In order to reach the new peak value, the engineers at Linde have made the mast of this narrow-aisle truck even more stable. With the K truck, companies are best equipped for the trend towards ever increasing lifting heights. The windscreen of the new K truck is 80 mm larger than that of the previous model. This means the view of the forks is increased by 20 percent which ensures for safer handling and fewer collisions. Due to the improved visibility, the driver does not have to move as much in the cab in order to see the loads thus ensuring fatigue-free work. The mirror module of the K truck is available with additional functions on request. Mirrors provide assistance when reversing and driving into aisles. An LED work light improves the view into the shelves. The new K truck is not only around 5 percent more powerful than its predecessor, it also consumes on average around 25 percent less energy. This top performance is made possible through an optimized hydraulics system, better weight distribution, a new lateral oscillation drive system and speed-controlled pumps with an intelligent control system. The improved performance ensures higher driving and lifting speeds and thereby more efficient handling in high rack warehouses. The emergency alarm detects unusual behavior and thus indicates the driver of a potential emergency situation. In order to help prevent possible accidents, the system warns of a hazardous situation with both an acoustic and optical signal. This is made possible in part by various sensors in the control panel, side panel and deadman's switch. The K has a variety of intelligent assistance and safety systems that support the driver in storing and retrieving goods quickly and easily. Active Stability Control enhances these systems and makes the K even more efficient: The system recognizes unevenness between the left and right sides of the aisle and evens out impacts and vibration automatically, enabling the truck to achieve its maximum handling performance even on less than optimal floors. The K truck is available with 64 different mast heights and designs. In this way users can select the required operating height depending on the shelf heights, and for example, with the help of a telescoped triplex mast, display lower clearance heights despite high lift heights. With the K truck different motor and battery powers are available for higher driving and lifting speeds and intensive load handling with high throughput rates. When used in a high rack warehouse narrow aisle trucks should be matched optimally to the aisle widths. That is why companies can select the most suitable width from five different chassis widths available for the K truck. The cabin of the K truck can be adjusted depending on the area of use and working environment. For example, it can be equipped with a completely closed and heated cabin for aisles with strong drafts or for use in refrigerated warehouses. The new version of the K truck even has an extended cabin depth and therefore 50 mm of additional room for movement. With the comfort cabin option, the additional depth is actually 100 mm. The K truck comes available with the option for a standard control panel or a split control panel. The split control panel, in which the control elements are integrated in the left and right arm rests, facilitates the driver's work during intensive load handling involving the frequent removal and storage of items. 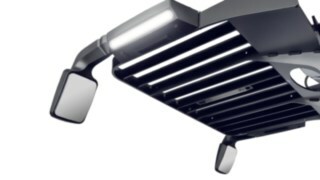 The control elements are directly accessible with minimal effort required.